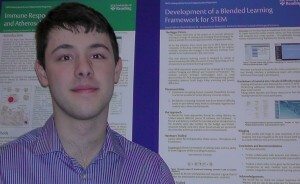 To introduce myself, I am Sam Holton, a second- year student in the School of Biological Sciences here at Reading. Christmas and New Year are over and being the ambitious student I am, it was time for me to get back to work! Due to the success of my UROP placement, which I undertook over the summer of 2012 with Kimberley Watson and Teeroumanee Nadan working on the Modular Training for Industry project, I was invited back to continue on the project. This time my work is being funded by the Digitally Ready team and I am very grateful for this opportunity. My 2012 UROP responsibilities included work on the ‘Genome to Proteome’ module. I had to break down lecture materials into a detailed storyboard expanding over three levels. This was quite challenging to say the least! Technology-wise, I played with several packages and equipment new to me and quickly grasped the concepts of video and audio editing. Software packages tested included Audacity, Camtesia Studio, Adobe, Movie Maker, among others. We even recorded sounds and videos. Equipment used included camcorder, voice recorder, smart boards, tablet and stylus. After much deliberation the major consensus is that Articulate Storyline is the best piece of software to present our modules. I have had a go at creating some interesting interactive slides on Articulate Engage including an interactive timeline. This can then be imported into Articulate Storyline. Part of my work in the modular approach was presented at the Teaching & Learning Showcase event on Flexible Learning last term, and I also participated in a Digitally Ready event on ‘Students’ experiences with placements and opportunities for developing their digital literacies at the University’. I have had the opportunity to have social gatherings with Tee and other research students, and it was exciting to hear people talk with such passion about both biology and technologies. I’m looking forward to more of these! This time I am also looking at the ‘Integrated Systems Approach’ multidisciplinary and I’m working closely with my day-to-day supervisor Tee. I will be developing and hopefully piloting the diagnostic tool which will differentiate candidates for different entry levels to access the module. I have already started work on this module and I am discovering about computational biology and it all very exciting. The knowledge gained will also be of great benefit for my Bioinformatics module this term. I have also been looking at the ‘Structure Based Drug Design’ lecture, playing with a visualisation software called PyMOL, I am way ahead of my course lectures, as this will only be covered this term. After a good start all round, I now need to proceed and produce something really interactive for online learning! To increase my understanding of the School of Biological Sciences project to support internationalisation for students’ employability and to be able to continue work already done, on 24 January I will be attending a talk by Simon Sweeney who is the Higher Education Academy (HEA) advisor for the Internationalisation Change Programme (ICP). This talk will include a discussion with University staff and what implications there are for the University of Reading regarding Internationalisation. I am currently working part time on these projects and will keep you updated with my progress over the coming weeks. This entry was posted in Internationalisation, Small project funding scheme and tagged Articulate Engage, Articulate Storyline, Flexible Learning, Internationalisation Change Programme (ICP), Kimberley Watson, Modular Training for Industry, PyMOL, Sam Holton, School of Biological Sciences, Simon Sweeney, Students’ experiences with placements and opportunities for developing their digital literacies at the University, Teaching & Learning Showcase events, Tee Nadan, Undergraduate Research Opportunities Programme (UROP). Bookmark the permalink.